The Egyptians were strong believers in Fate and Destiny and used Divination in Many forms. 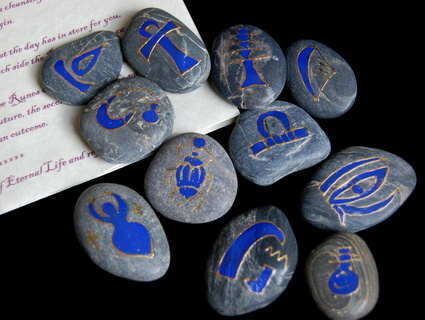 These beautiful Egyptian Oracle Runes have been based on the Wisdom and Knowledge of the Ancient Egyptians using their Hieroglyphs and symbols. They will come complete with their own Handmade Black Velvet Pouch which has been decorated with an Eye of Horus design and a Full instruction leaflet containing the Oracle Rune symbols, their meanings and Casting instructions.